Hui Lin, who was killed when struck by a pickup truck in August 2009. 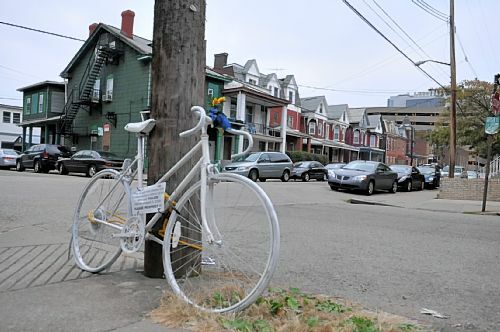 It doesn't cost much to make a stripped-down white bicycle to leave as a memorial near the spot where a rider died. is left is pristine and ethereal. Clean. tight, busy intersection of Meyran Avenue and Louisa Street. Mr. Lin's story -- father of two, bicyclist, dead. with is odd in our society. But I feel like it shouldn't be." up with a Polish family in Monroeville. "I didn't know how it was going to be perceived by the community,"
But he felt he had to do something. "You can look at this and say it's just about bikes, but it's not," he said. "It's about people." "Something about needless death really bothers the hell out of me," he said. He got involved making ghost bikes after the one for Mr. Lin. one-way street, no helmet on, ran a stop sign into a busy intersection,"
concern for safety. There's no ghost bike for him." Contrast that with Mr. Parker, the cyclist who died in Indiana Township. "He should absolutely be alive," Mr. de la Cretaz said. "He did everything right. That's something we want to memorialize." service and placed it on Hart's Run Road. remember him. It's a great honor, but it's hard knowing what it means." PennDOT removed it after fewer than three weeks. too hard for her to see it regularly. I respect that." PennDOT's Pittsburgh-based spokesman, Jim Struzzi, said the agency respects what the memorials mean to families. a public right-of-way without checking with us first," he said. drivers, Mr. Struzzi said, such a memorial could be counterproductive. "You don't want to create a dangerous situation," he said. With Mr. Parker's ghost bike, PennDOT acted on a complaint, he said. come pick it up," Mr. Struzzi said. "We don't destroy it or anything." The ones that remain will be maintained. New paint now and again, flowers in the summer. At least that's the plan. "We want them to be there a long while," Mr. de la Cretaz said. killed. It was a statement of protest, art and activism. There were 13 or 14 of them, painted white and mangled. bikes was cathartic in more ways than one. frames. It was kind of fun, actually." "The city, PennDOT, whoever, was really quick to pick them up," Mr.
lot of attention. And that was kind of the point." Known almost universally in Pittsburgh's cycling community as "Erok,"
nonprofit Bike Pittsburgh, which has nothing to do with the ghost bikes. in all and 22 other countries. A doctoral student at the University of Pittsburgh in 2004, Mr. Your Legs! ': The Politics and Counterculture of the Bicycle." "Basically, this was the reality but what else could be possible," he said. Ghost bikes fit neatly into the history of protest and advocacy among bicyclists, he said. meters for the maximum time and laying down sod and small trees. "There was a lot of humor and a lot of creativity," Mr. Furness said. for the placing of the ghost bike for Mr. Parker. "I hear a lot that it's just activists co-opting people's deaths to make a point, but that's not really true," she said. Most jarring to her, she said, is animosity toward riders. that people riding in the road deserve to die. I hear that a lot. "This is a life you're talking about." Ghost bikes and memorial rides only accomplish so much. Mr. de la Cretaz said his passion for riding and evangelizing safety comes in part from his being a driver as well. "I know how oblivious people can be to someone on a bike." Jacob Quinn Sanders, a Pittsburgh freelance writer, also writes a food blog, www.eatsburgh.com. There are more photos available from the online article.